Bring your team for a thrilling hot lap experience with the Mike Racing crew and celebrate your year over a delicious BBQ breakfast, lunch or dinner. Contact us to discuss alternative days for bookings over 50. Bookings must be confirmed prior to 7 November 2018. Additional hot lap dates may become available once the first date sells out. If you can't make the date above but want to take part, contact us. Flexible dates are available for hot lap bookings over 50 people. WHAT DOES THE HOT LAP EXPERIENCE INVOLVE? 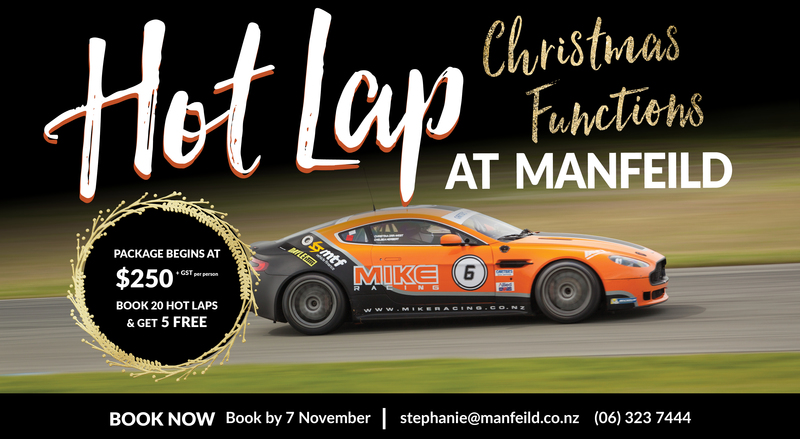 The hot lap experience allows each team member to ride as passenger in an Aston Martin Vantage GT4 race car driven by an experienced race car driver. Your team members will suit up in race apparel, which is provided. However, you need to bring your own closed toe shoes and undertake a compulsory briefing by the Mike Racing crew. Hot laps take place from 9am - 4.30pm. Choose what type of catering you prefer and when you'd prefer your hot lap experience. You will be up close to the action in one of our pitlane garages during the hot lap experience. Your BBQ meal will be served in one of Manfeild's pitlane suites overlooking Circuit Chris Amon.